Yippee.....I'm Pregnant...Can I use essential oils in pregnancy ? Pregnancy is a rollercoaster, it is an amazing, wonderful, utterly mind- blowing, exhausting and ridiculously hormonal experience....well for me it was.....I had twins !! At this time..... it is so important to do what is best for you and your growing baby (babies in some cases !) using aromatherapy oils, at this time, warrants a stand alone page as it is imperative that the guidelines are followed - please read the advice given before and if you choose to use aromatherapy oils during your pregnancy. AS ALWAYS PLEASE CONSULT YOUR PHYSICIAN OR HEALTHCARE PROVIDER BEFORE USING ESSENTIAL OILS DURING YOUR PREGNANCY. Using aromatherapy essential oils in pregnancy has been debated widely, the rationale behind this is the absorption of the aromatherapy essential oils through the skin and into the blood stream and ultimately crossing the placental barrier to the unborn child. Hence many aromatherapists will not directly apply essential oils onto the skin of a pregnant mother at any time during the pregnancy, preferring to use other methods of aromatherapy such as inhalation, if any are used at all. The reason for such justified caution is that many aromatherapy essential oils are emmenagogic, abortifacient, oestrogen and progesterone stimulating, have a direct effect on the nervous, hepatic and renal systems or are deemed toxic.....these are all harmful to pregnancy and will be explained and listed below. Do not ever use aromatherapy essential oils oils in pregnancy without taking your physician or health providers advice first. 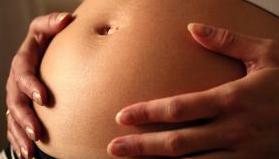 Do not use aromatherapy essential oils in the first trimester of pregnancy. Do not ever use aromatherapy essential oils if there is a history of miscarriage, bleeding or problematic pregnancies previously. Do not use aromatherapy essential oils if the skin becomes super sensitive (as it becomes more permeable in pregnancy) ,or sense of smell becomes super sensitive, as sometimes happens in pregnancy as it may provoke adverse reactions. After the first trimester only use essential oils in minute doses, that is one drop of the advised essential oils to 5ml of olive oil carrier oil. The picture above shows model of an 8 week foetus - incredible and amazing that 7 months later it will be a beautiful baby ! These are aromatherapy oils that stimulate menstruation, that bring on the monthly period, they assist and induce monthly bleeding. Aromatherapy oils that are considered emmenagogues are Clary sage, Cedarwood, Jasmine, Juniper,Marjoram, Myrrh, Peppermint and Rosemary essential oils. 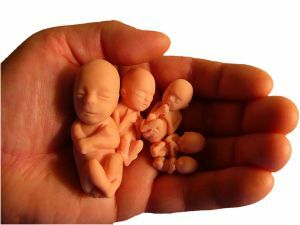 The picture shows models detailing the development of a foetus from 7 to 12 weeks gestation - truly miraculous ! The citrus essential oils, Neroli, Petigrain, Mandarin, Grapefruit, Lemon and Orange Essental oils. Please note that these citrus aromatherapy essential oils are phototoxic, which means that they should not be used on the skin if the recipient is going to be exposed to ultraviolet light soon afterwards .....either from sunshine or sunbeds....the citrus oils react with the ultraviolet light and may result in changes in skin pigmentation or burning of the skin. There are other essential oils, that other aromatherapists may use but for me personally that is it, the citrus essential oils that I have discussed above and only when I am happy that the other precautionary criteria, that has been advised above, is fulfilled. Also, I would only use olive oil as a carrier oil as it is safe and wonderful for the skin, please have a look at the olive oil benefits page .....The Olive Oil Benefits page.